Police officers guard the 'Seituna' cultural society in Berlin, Germany, Thursday, Nov. 26, 2015. German police said Friday they have released two men arrested a day earlier on suspicion of planning a "serious" attack against the state. Police told local media no evidence was found to hold the men, who were detained on the outskirts of Berlin following a raid on an Islamic cultural center. Following the raid, authorities cleared the area surrounding the men's vehicle, which was said to contain a suspicious object. The item turned out to be harmless and no weapons or explosives were found. Authorities say the men are aged 28 and 46, but have not released their identities or information on their alleged plot. They say an investigation is ongoing. Citing security sources, Germany's Tagesspiegel said the men had Islamic State links, and were planning on attack on the western city of Dortmund. Officials have not confirmed that report, which said one of the men was Syrian and the other was Tunisian. 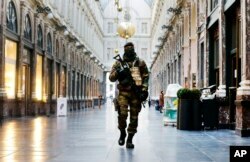 FILE - In this Thursday, Nov. 26, 2015 file photo, a Belgian Army soldier walks through the Galleries Royal Saint-Hubert in the center of Brussels. Some experts say it will take months for Europeans to psychologically adapt to life after the Paris attacks. Separately, German prosecutors said Friday they have arrested a 34-year-old on suspicion of trafficking illegal weapons. Prosecutors in Stuttgart said the man, whose name was not given, is suspected of converting starter guns, which fire blanks, into deadly weapons. The Bild newspaper reported the man is also thought to have sold four assault rifles that may have been used in the recent deadly Paris attacks. European authorities have been on high alert following the gun and bomb attacks in Paris, France, which killed 130 people. The attack was claimed by the Islamic State Sunni Muslim extremist group, which has threatened more attacks on the West. Many Western nations have already been involved in a 18-month-long U.S.-led bombing campaign against Islamic State targets in Iraq and Syria. Following the Paris attacks, Western leaders have been under increasing pressure to take more decisive action against the group. Germany on Thursday pledged to send reconnaissance and tanker planes, a warship, and provide satellite surveillance to help France fight IS.